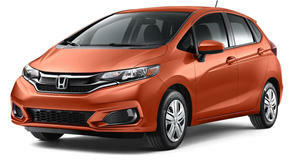 Honda showed the world just how big its Jazz (Fit) is by cramming everything from bodybuilders to ninjas inside of it. Unless you watch Australian television, chances are you&apos;ve never seen the hilarious and ingenious Jazz Packing series of ads created by DTDigital. The Jazz Packing series won all types of awards for the way it creatively and cleverly showed off just how spacious Honda&apos;s hatchback actually is. If you&apos;re a fan of car commercials that deviate from the norm in the funniest way possible, then continue below to check out the entire ad series from DTDigital. Who would&apos;ve thought that ninjas loved the Honda Fit? They&apos;re apparently fans of its power windows, engine and its spacious cargo area. Also, when did pirates and ninjas become enemies? After putting ninjas into a Fit, Honda decided to see how much rap it could cram into its economical hatchback using "Take U to Da Movies" rapper Bangs. Here&apos;s hoping that Honda Australia was laughing with, and not at, Internet sensation Bangs when they filmed this commercial. Packing bodybuilders into a car of any size is not any easy thing to do. That being said, Honda somehow managed to fit nine muscular men and women into a Fit. The muscular spokesman talking about his love of protein shakes and flexing is the highlight of this commercial. This ad shows just how easy it is to cram a handful of hipsters and a few fixies into a Fit. Thankfully Honda&apos;s engineers designed the Fit&apos;s windows to be big enough to let you see all of the conformist pedestrians and motorists trying to bite your individuality. This add uses Tetris to show just how much cargo space is available inside the Fit. This German commercial is unrelated to Honda Australia&apos;s Jazz Packing ads, but its equally creative and entertaining. We took a 1,000-mile road trip in the Fit to see how it survives outside the city. If it’s space for after, the Honda Fit should be the sub-compact car for you.